PA Chairman will demand that Israel release arch terrorists and freeze construction in return for continuation of talks. 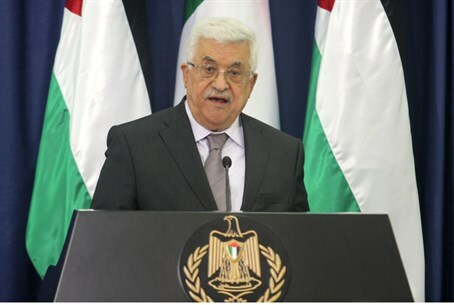 Palestinian Authority (PA) Chairman Mahmoud Abbas plans to demand that Israel release arch terrorists and freeze construction in Judea and Samaria in return for Abbas agreeing to extend peace talks, the Al-Hayat newspaper reported on Sunday. According to the report, Abbas plans to make these demands during his meeting with United States President Barack Obama in Washington on Monday. The PA Chairman reportedly plans to demand that Israel release terrorists Ahmed Saadat and Marwan Barghouti. Saadat, who heads the Popular Front for the Liberation of Palestine (PFLP), planned the assassination of Israeli Tourism Minister Rehavam Ze’evi in 2001. Saadat was sentenced in 2008 to 30 years in prison for heading the PFLP. Barghouti, a senior member of Abbas’s Fatah party, is serving five life sentences for planning numerous terror attacks against Israelis. On Saturday, Abbas’s spokesman, Nabil Abu Rudeineh, said that the PA Chairman plans to speak with Obama on all issues related to the realization of a two-state solution and the establishment of a just and balanced peace that will result in the establishment of an independent Palestinian state whose capital is Jerusalem.